​ at the Gage Gallery, 2031 Oak Bay Avenue October 27 - November 14, 2015. One definition of intersection is the common ground between theories or phenomena. These three artists are connected by similar interests in consciousness, technology and nature. 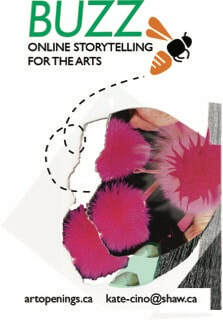 Anna Curtin received her MA in Fine Art from the University of Gloucester in Cheltenham, England. She graduated with a distinction in painting in 2014. At Intersections, selected artworks from Anna Curtin’s MA project premiere in Canada. The mixed media works combine her personal experience of being in nature, with the phenomenon of GPS tracking and technology. 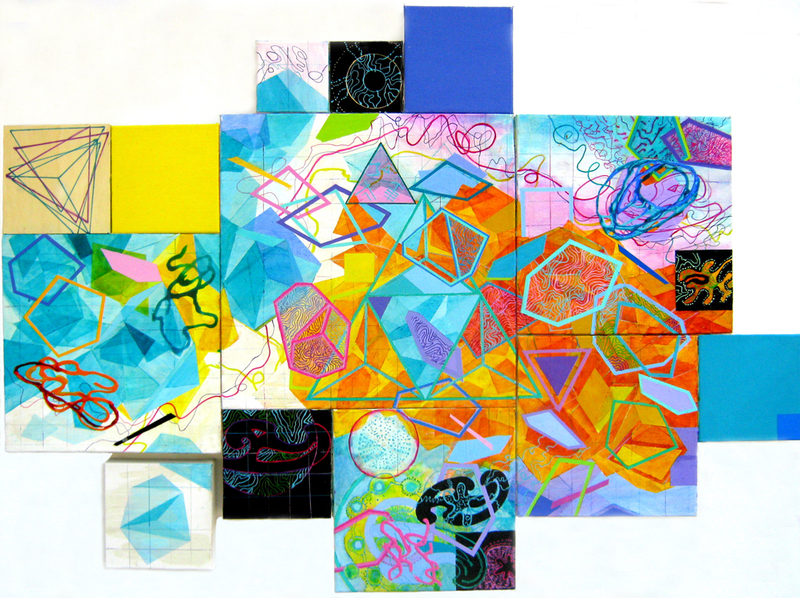 Born and raised on the west coast, Curtin explains: “I’m very attached to the energetic beauty of land, sea and sky, and strive to express this essence in my paintings.” Curtin’s advisors encouraged her to juxtapose her personal experiences of environment with other lines of thought and viewpoints. She decided to take digital walks and bike rides around Cheltenham. Curtin used a handheld mapping device favoured by professional geologists to track her movements. The device records information using the Global Positioning System (GPS). Conceived and operated by the US military, the GPS radio-navigation system is a constellation of 24 satellites connected to ground stations. Cheltenham, located about two hours north of London, is the headquarters for British intelligence and security. 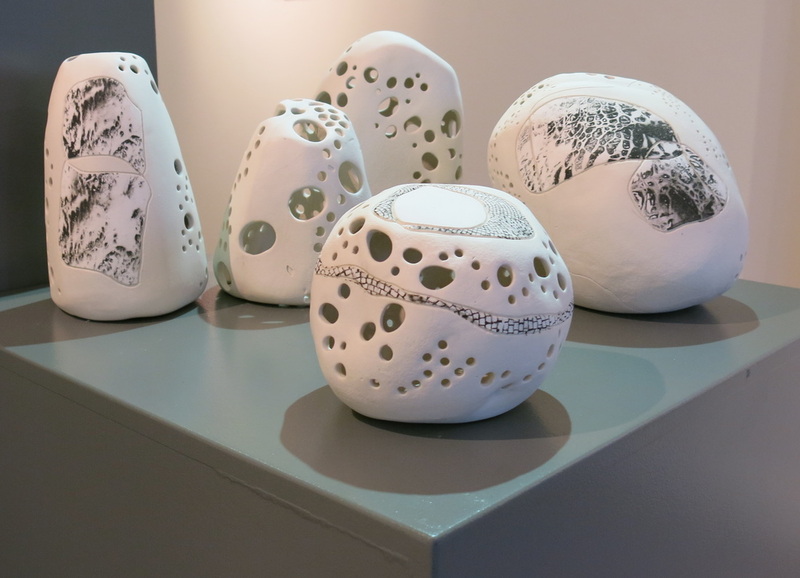 In Intersections, Dickie exhibits a collection of porcelain forms with hand-carved holes in various sizes and shapes. The enigmatic organic forms are intact containers, devoid of content. “This work calls attention to space defining form,” says Dickie. Carole Thompson’s acrylic paintings combine geometric forms, colour theory and metaphysical concepts. Using square panels of various sizes, Carole Thompson builds an ambiguous visual space, suggesting movement and expansion. Her varied shapes include crystalline structures, cellular forms, oceanic shells and corals, often in multiple-point perspective. Macro and micro co-exist; patterns and symbols appear as coded messages. Meandering and energetic linework connects adjacent areas. “I like the sense of freedom in the free-flowing lines,” she says. New techniques used by the artist in this series include stencil designs, working wet on wet, and creating interesting shapes with acrylic pouring medium. An accomplished colourist, the artist uses harmonious colour fields and split complementary relationships to kindle emotional engagement in the viewer. She notes that Russian artist Kazimir Malevich (1879-1935), also stressed the ability of colour to evoke a feeling response. Malevich was a leader in abstract art theories. He concluded the “pure feeling” of abstraction can propel the viewer beyond perceived reality into infinite or true reality. Famous for his black square on a white ground, he argued that shape and colour supersede image and narrative. “I’ve begun to use a lot more white in my paintings,” Thompson says, “this furthers a fluid composition and sense of space.” Here the artist's shifting realities in paint intersect with quantum physics, which assures us that all matter is in motion, and has some puzzling paradoxical properties.